As a band, you know you’re doing something right when within weeks of releasing your debut album you’re selling out shows to crowds who already know the lyrics to all your songs because they haven’t been able to stop listening to your recordings on endless repeat. But, there’s always the hanging question of whether a great album can translate well to a live show—will the same energy, sound, and accuracy that can be produced by multiple takes in a studio find its way to the stage? 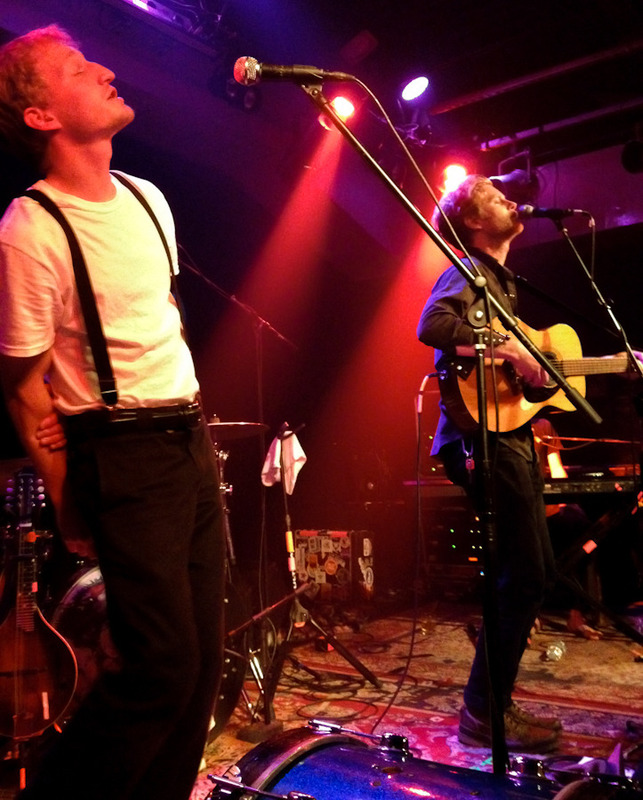 On April 22nd at Jammin’ Java, the Colorado-based band The Lumineers answered these questions with a “HELL YES!” As the band took the stage, frontman Wesley Schultz said with enthusiasm, “Here’s to making Sunday night feel like Saturday night!” and launched into a high-energy, unforgettable show. The set started off with “Classy Girl” and “Big Parade,” an excited crowd singing and clapping along to the catchy choruses. 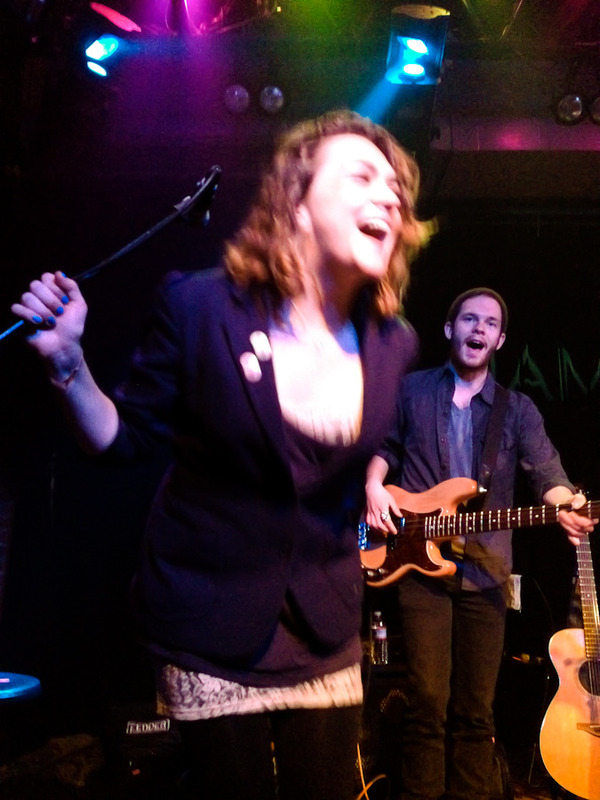 Cellist Neyla Pekarek danced around on stage while she sang duet with Schultz on “Ain’t Nobody’s Problem But My Own,” a track absent from their self-titled debut album. When The Lumineers played “Hey Ho” early in the set, the crowd went crazy and the band demonstrated that (although absent confetti) the song was just as fun to hear live as it appeared in their music video. The crowd easily acquiesced to their encouragement to shout “hey!” “ho!” and pump fists in the air in unison. Only having a one album in their repertoire, the band did an excellent job of showcasing their talent by filling out the set with covers. They took on Bob Dylan’s “Subterranean Homesick Blues,” a song that has lyrical tongue twists that rival REM’s “It’s the End of the World as We Know It” and Schultz sang the words as well as if he’d written them himself. The addition of Pekarek’s cello gave the song a decidedly more complex and dark tone. The set slowed down a bit as Schultz poured his emotion out through an acoustic “Dead Sea,” the crowd singing along and joining in the catharsis. Percussionist Jeremiah Fraites joined Schultz for “Slow it Down,” playing kick drum and tambourine. The live performance of this song, which comes off quieter and more forgettable compared to other, catchier songs on the album, brought it to life as Fraites used his percussion to build momentum and intensity, slamming his tambourine on his kick drum at the song’s apex. The Lumineers closed the set with “Stubborn Love” and the crowd lost any inhibition they carried with them earlier in the show, now dancing and crying out the song’s positive message to “keep your head up, keep your love.” The band left the stage and the thrill of the song kept the crowd cheering loudly until The Lumineers returned for an encore. The encore began subdued with “Charlie Boy,” a somber song about a boy headed to war. The band left the stage and entered the crowd to play a song in the middle of the floor, Fraites asking an audience member to hold his xylophone for him as he beat on it. The crowd stomped their boots along and listened aptly as the band played “Darlene,” another song that didn’t make it on onto the debut album. Upon retaking the stage, The Lumineers closed the evening with a cover of The Band’s “The Weight (Take a Load off Annie)” in tribute to recently-deceased drummer Levon Helm, again, with heavy crowd enthusiasm and participation. As the show closed, the band members crossed the stage to hug each other, reinforcing the happy, family hoedown atmosphere their music had created. Their tour continues at a breakneck pace through the South before returning to Vienna, Virginia in late June. If you haven’t heard the album yet, do yourself a favor and stream it for free here. To hear more chatter about The Lumineers' album, listen to us review it on Episode 5 of the podcast.